Indian weaving industry is one of the greatest employers of rural labor after agriculture, providing employment to around 12.5 million people in India. Abundance of raw materials and availability of cheap labor are the main reasons for the growth. There is a lot of demand for textiles both from within the country and outside. Weaving products contribute to 4% of GDP. It is estimated that the industry will grow at a CAGR of 25-30%. The industry contributes 14% of total industrial output and around 30% of total exports in India. The industry mainly consists of unorganized players. There are approximately 5 million looms in India. Lack of innovation, high power tariffs, frequent power outages, archaic labor laws, lowest number of shuttle less looms, outdated technology, absence of trade pacts with other nations are some of the problems dogging the weaving industry that impact productivity. 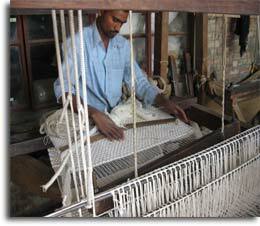 The weaving industry is concentrated in Northern and Southern parts of India. Andhra Pradesh leads the pack as the Southern State with highest number of looms. India has the potential to increase its textile and apparel share in the world trade from current level of 4.5% to 8% and reach US $ 80 billion by 2020. Waiver of overdue loans in the handloom sector by Government has benefited 3 lakh handloom weavers. The Government has mooted the idea for integrated textile parks which when implemented will augur well for this industry. Centers of Excellence for research and training will definitely aid the growth of the weaving industry.